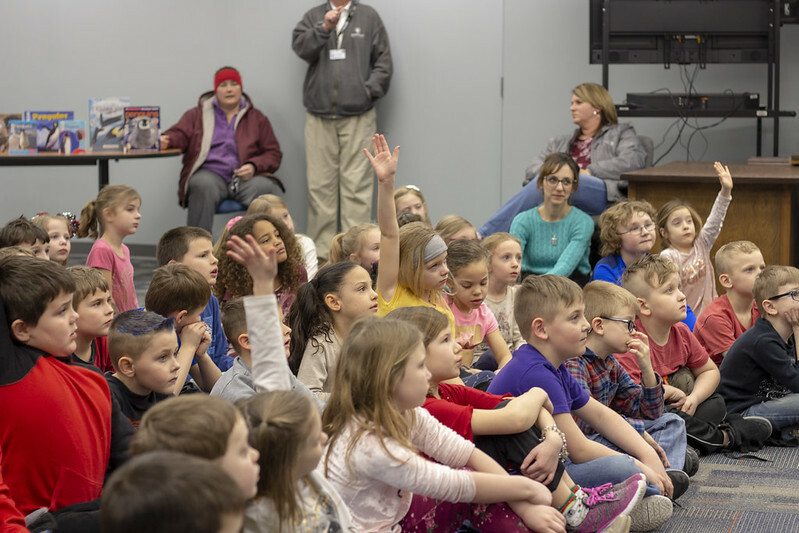 Each year, Greeneview first grade classes visit Jamestown Community Library to complete a research assignment on penguins—by selecting a book from our homework shelf and writing down facts they learned from the book they read. 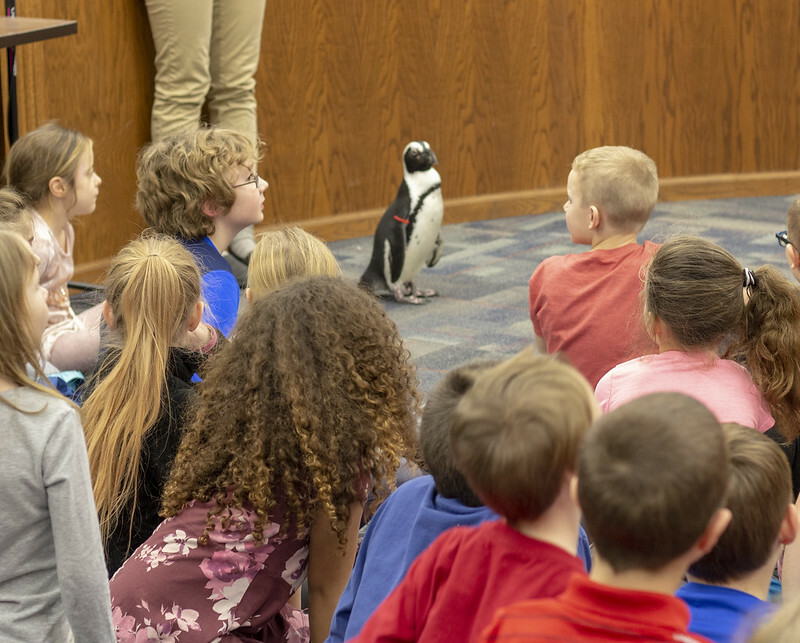 The first graders also make an annual field trip to the library, and this year, we scheduled a program as a tie-in with their penguin assignment. 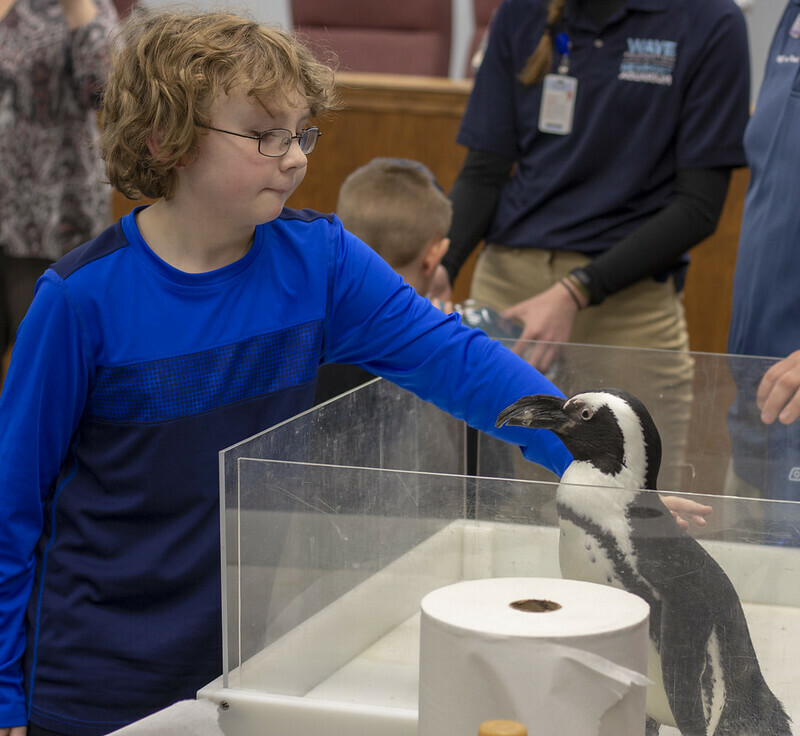 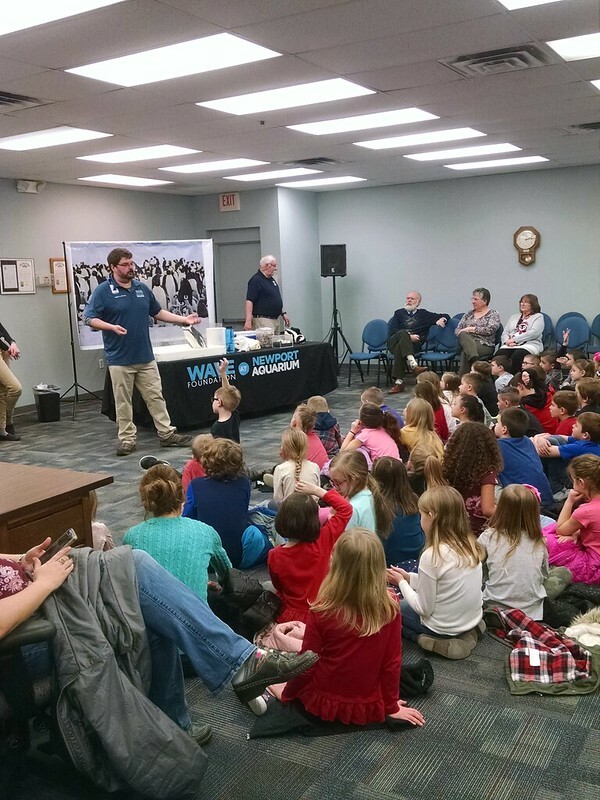 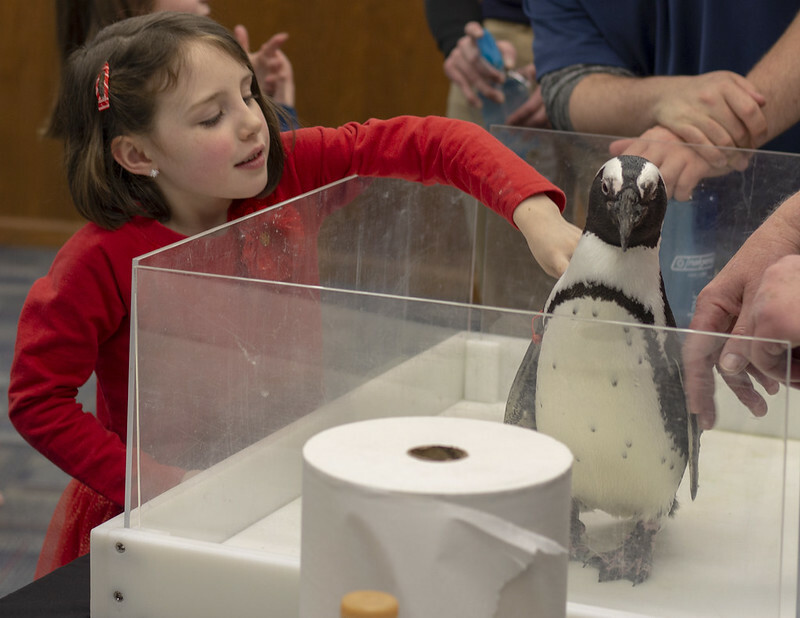 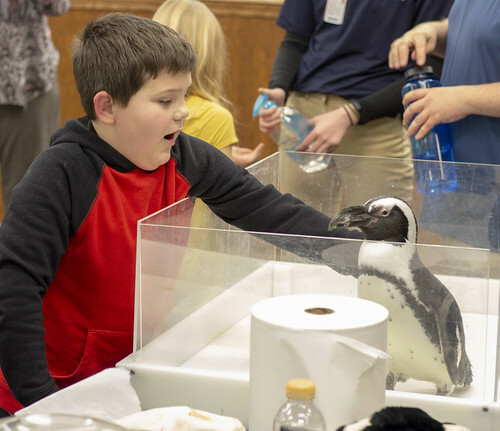 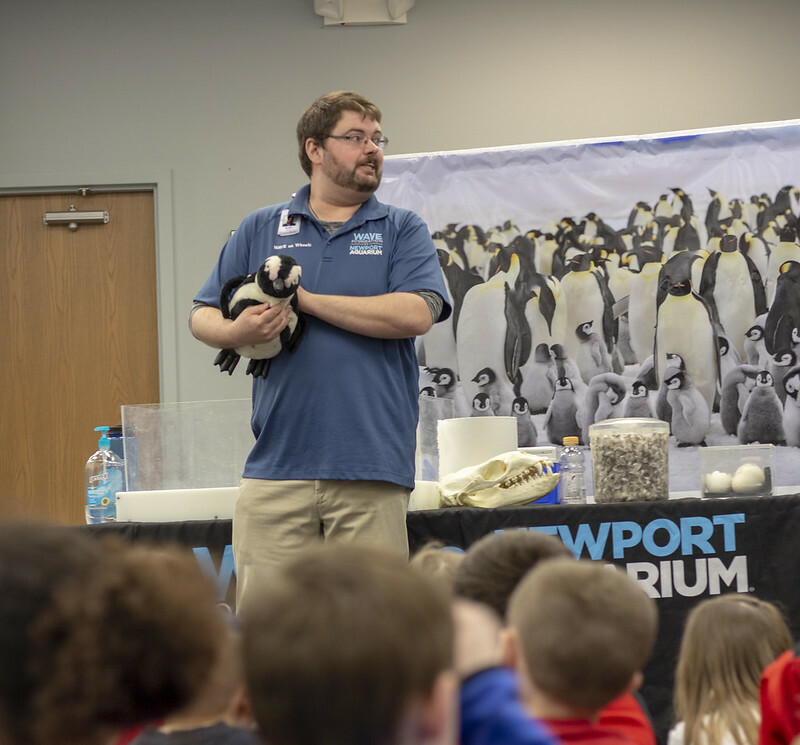 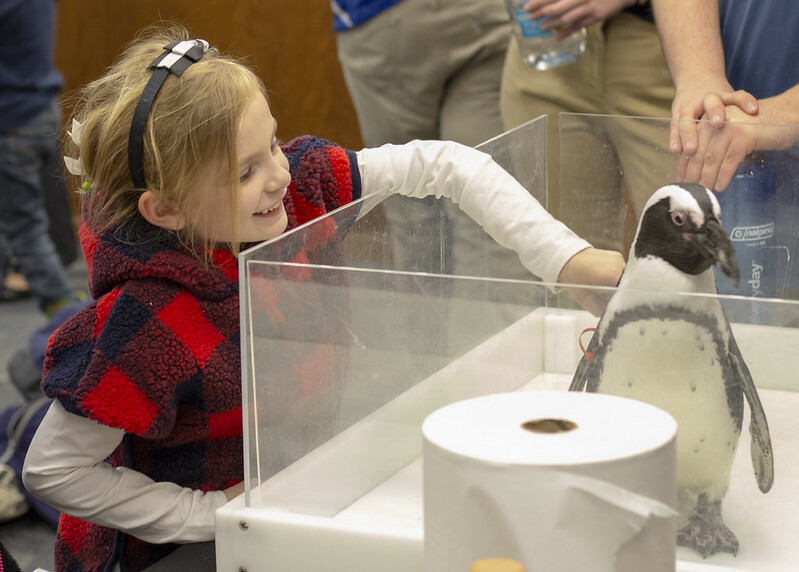 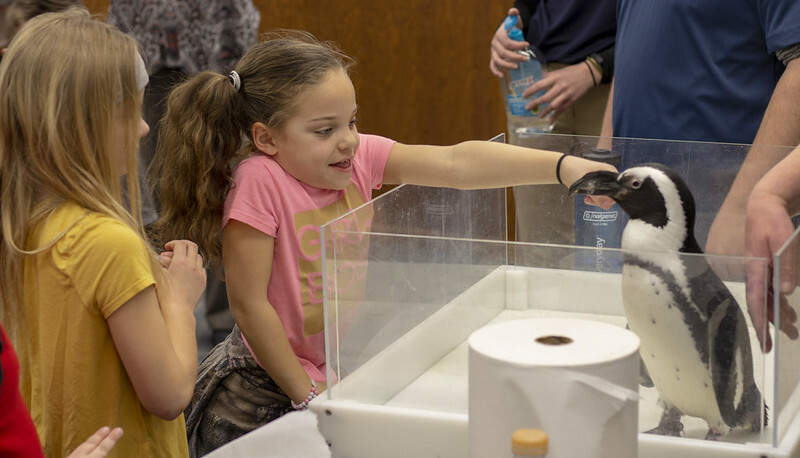 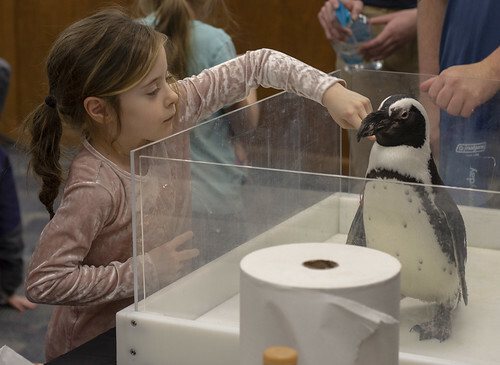 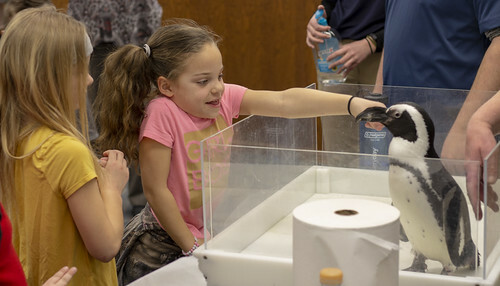 As a special event, we invited the Wave Foundation—Newport Aquariums’ educational outreach program—to bring one of their penguin ambassadors for a visit. 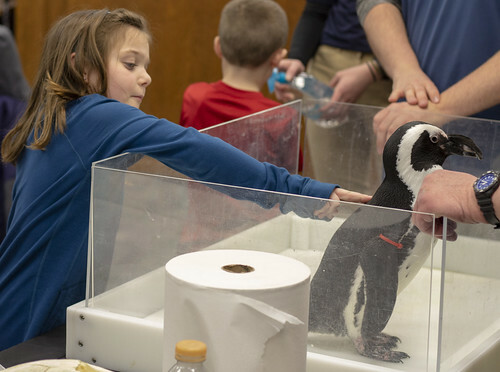 This way the kids could learn more, and get up close to a real penguin. Accompanied by educators Ryan, Larry, and Allison, Red Pepper the African penguin spent the afternoon interacting with the kids while they learned more about penguins in the wild. Did you know that more species of penguins live in warm weather climates than cold? 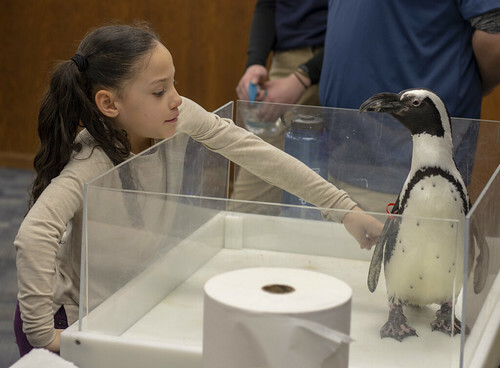 African penguins live on the islands and coastline of South Africa and Namibia. 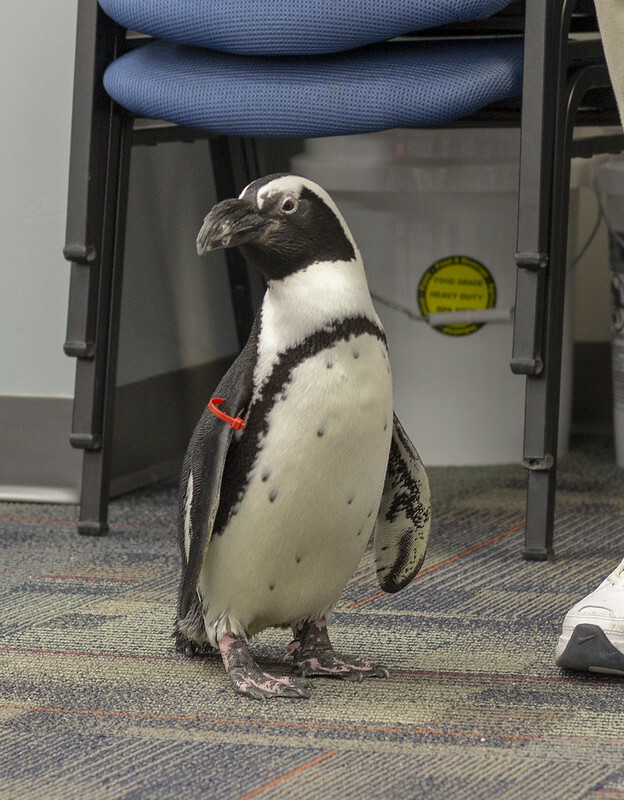 Unfortunately, they are classified as endangered. 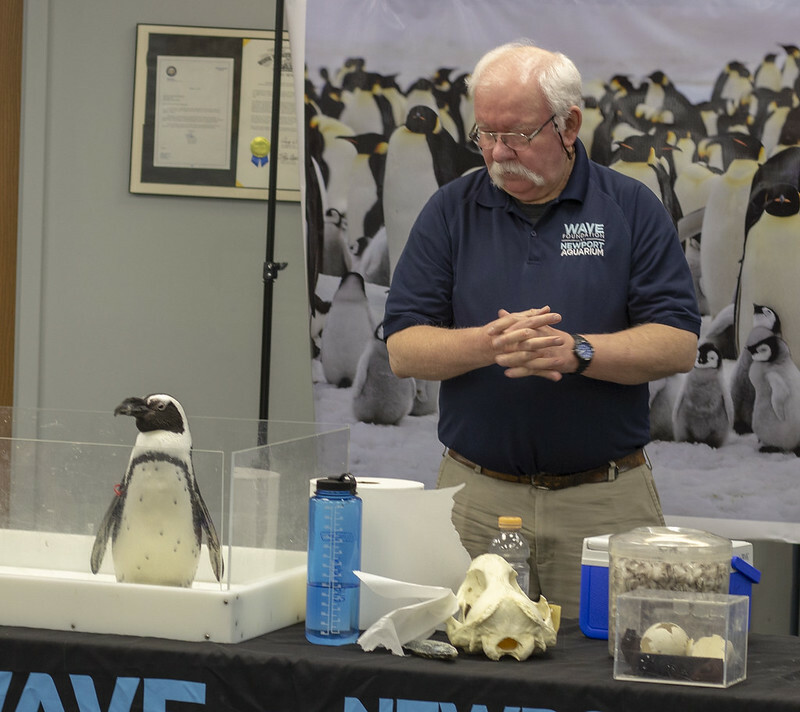 Loss of habitat, competition for food from the commercial fishing industry, oil spills, and predators all threaten their survival. 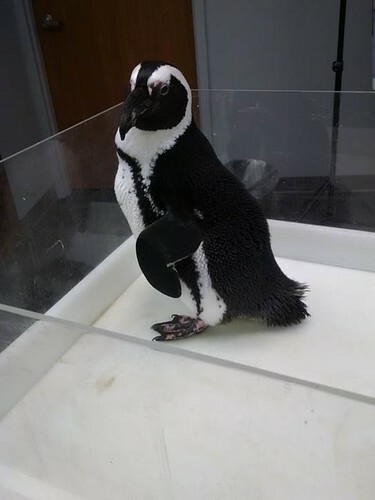 Currently there are 29 known colonies of African penguins in the wild. Because they are a warm-weather species they are easier to care for in captivity, and many breeding and conservation programs have been undertaken by zoos and aquariums. 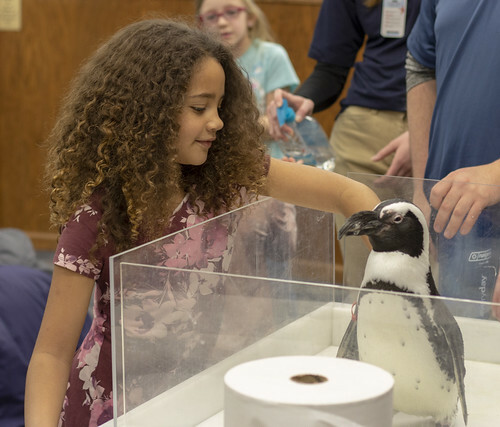 They are also known as the black-footed penguin or the jackass penguin, a name given them due to the loud donkey-like braying sound they make. They are a popular attraction in zoos, and they are quite comfortable and charismatic around people. 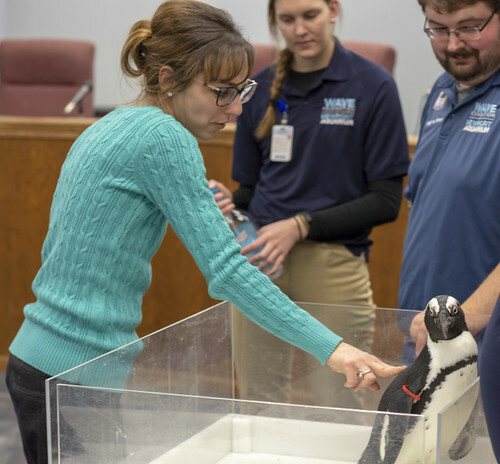 As you can imagine, they are excellent swimmers and deep divers. 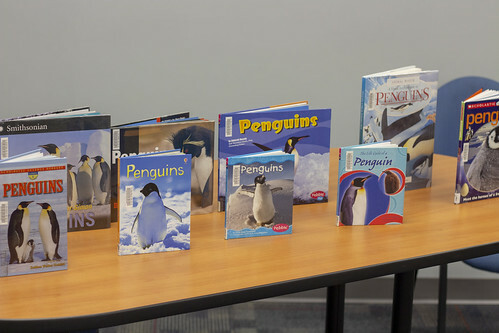 They live primarily on anchovies and sardines. 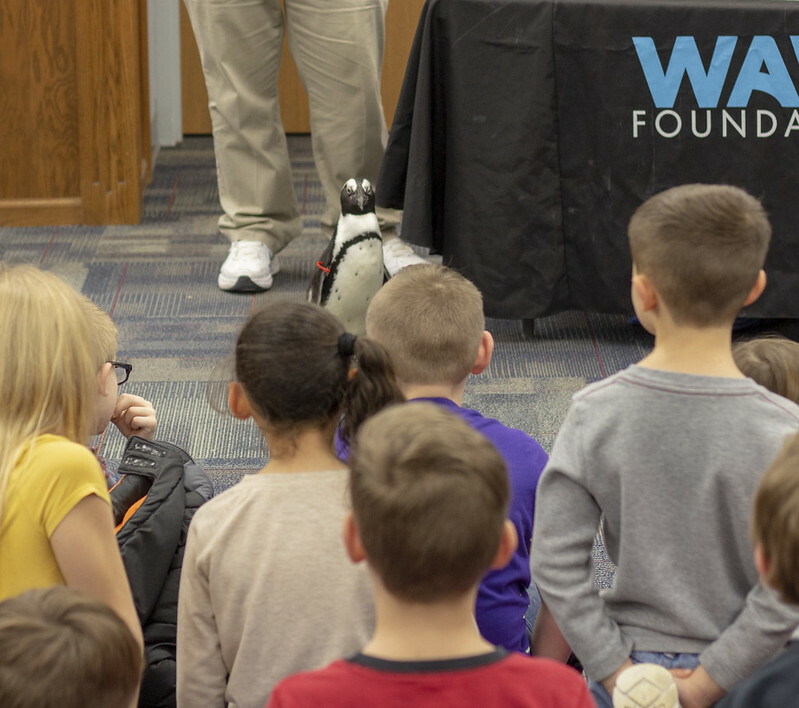 For more information on the WAVE Foundation and WAVE on Wheels, please visit wavefoundation.org. For a fun online resource about African penguins visit the San Diego Zoo kids page, and be sure and take a look at their live Penguin Cam!